Private Limited Company Registration - How to register for PLC in India? What are the advantages for incorporation of Private Limited Company in India? 1. Limited risk to personal assets The shareholders of a private limited company have limited liability. This means that as a shareholder you will be liable to pay for company’s liability only to the extent of the contribution made by you. 2. 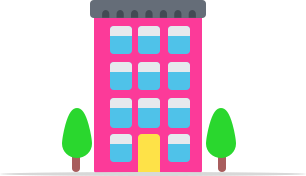 Legal Entity A PLC has a separate legal entity different from you. This means that the Company is responsible for the management of its assets and liabilities, debtors and creditors. And you are not responsible for it. So, the creditors cannot proceed against you to recover the money. 3. Raising Capital Even though registering a PLC comes with compliance requirements, it is preferred by entrepreneurs as it helps them raise funds through equity, expand and at the same time limits the liability. 4. Trustworthiness Companies in India are registered with the Registrar of companies(ROC) under Companies Act 2013. Anyone can check the details of the company through Ministry of Corporate Affairs (MCA). Also, details of all the directors are provided while the formation of the company. Hence a PLC form of business structure is trusted more. 5. Continue Existence A company has ‘perpetual succession’, that is continue or uninterrupted existence until it is legally dissolved. A company, being a separate legal person, is unaffected by the death or cessation of any member but continues to be in existence irrespective of the changes in membership. Confused about which company structure to choose? Try out our tool to decide! Looking to register your company as a private limited company? Registering your company as a private limited company is difficult as the procedure is complicated and involves many compliances. Do not fear as our experts can help you in every step of the private limited company registration. Instead of reading through the entire registration process, you can avail our expert service. Step 2: Apply for DIN (Director Identification Number) DIN is an identification number for a director. It has to be obtained by anyone who wants to be a director in a company. One DIN is enough to be a director in any number of companies. Option 1:File form DIN 3. This form required basic details of the proposed director along with identity proof like PAN, Aadhaar Card, etc and address proof. This is option is only available for existing companies. It means with effect from January 2018, the applicant need not file DIR-3 separately. Now DIN can be applied within SPICe form for up to three directors. Option 2: With filing SPICe, DINs gets issued to the proposed directors who do not have a DIN. Under this process of filing through SPICe (INC 32), maximum of three directors can apply for DIN. If applicant want to incorporate Company with more than 3 Directors and more than 3 persons doesn’t have DIN. In such situation applicant have to incorporate Company with 3 Directors and have to appoint new directors later on after incorporation. Option 3:Click on the link & let a ClearTax expert procure DIN for you. 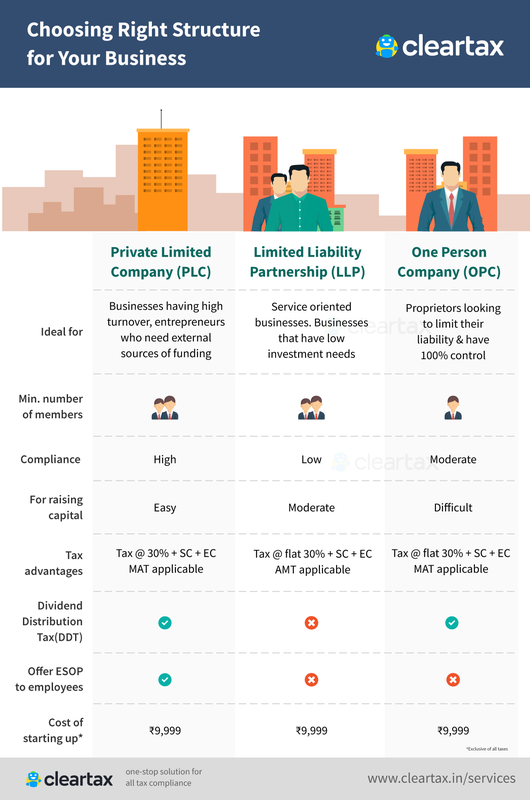 If you go for Private Limited Company – Registration with ClearTax, up to 2 DINs are covered in the plan & there is no need to apply for DIN separately. 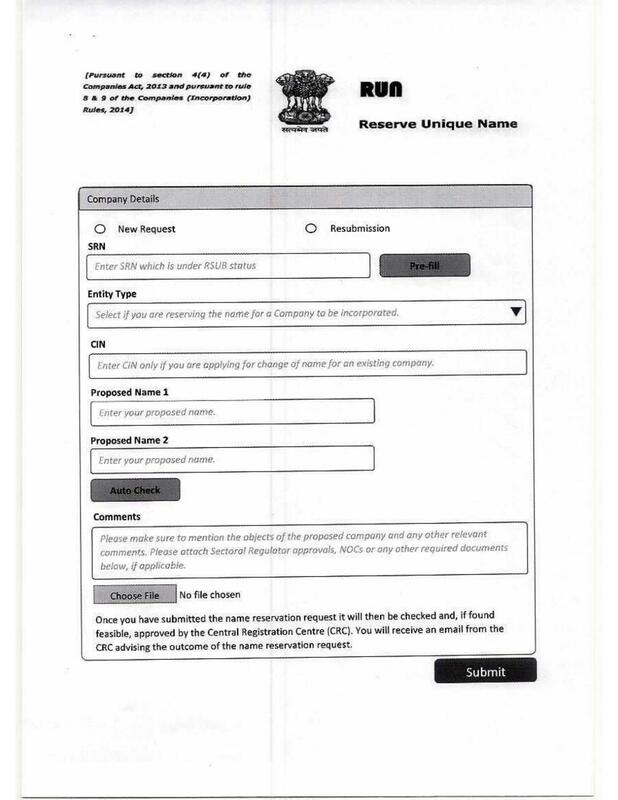 Option 1:Incorporating a Company via RUN (Reserve Unique Name) form: In an attempt to ease procedures for new as well as existing companies, the Ministry of Corporate Affairs (MCA) has introduced RUN web service for the incorporation of a company. RUN gives only one chance for applying and in case of rejection of the name due to any similarity of name with a registered company, an LLP or trademark or due to non-adherence of the Companies (Incorporation Rules) 2014, there are no second chances available. It means you have to be sure of the proposed name and should follow name availability guidelines, existing trademarks to avoid rejection. The applicant has to re-file another RUN form with prescribed fee. Please note that DSC and DIN shall not required for filling of RUN form for reservation of name. Only MCA Account is mandatory. However, with effect from March 23, 2018, Ministry has decided to permit two proposed Names and one re-submission (RSUB) while reserving Unique Names for the Companies. Option 2:You can apply for the proposed name through SPICe(INC-32) but only one name can be applied to this form, which is similar to that of the provision in RUN. Moreover, in case of rejection due to non-approval of the name, the applicant will get a second chance of refilling the same SPICe form without any further charges. It means you get two chances of filing the same form without any extra charge of paying Rs. 1000/- both the times. Prior to May 2015, the registration of companies required the filling up of several documents, such as the DIR–3 for acquiring the DIN (Director Identification Number), INC-1 for obtaining a name, INC–7 for registering the company with the Memorandum and Articles of Association, INC–22 for the registered office and finally, Form DIR-12 for the directors. Now, all of these forms have been merged together. The digital signature of a professional is required to file Form INC-32. The professional must certify that all the information given in the form is correct. The professional can be Chartered Accountant, Company Secretary, Cost Accountant or advocate. With effect from January 2018, New Process of Name Approval “RUN” notified and e-form INC-1 omitted. INC-7 form omitted. Only way out for incorporation of Company is SPICE. No ROC fees for Incorporation of Company up to 10 lack of authorized capital. Step 5: e-MoA(INC-33) and e-AoA (INC-34) e-MoA refers to an electronic Memorandum of Association and eAoA is electronic Articles of Association. These forms have been introduced to simplify the process of company registration in India. Memorandum represents the charter of the company while articles of association contain the internal rules and regulations of the company. Earlier memorandum of association and articles of association were required to be filed physically. But now these forms are filed online on MCA portal as a linked form with SPICe (INC-32). Both these forms must be digitally signed by subscribers to the Memorandum and Articles of Association. Step 6: PAN and TAN Application Through this single form SPICe, you can also apply for company’s PAN and TAN by using forms 49A for PAN and 49B for TAN. The system will auto-generate these forms after the submission of SPICe form. All you have to do is download it, affix digital signatures and upload both forms on MCA portal If all the details in the form are duly filled in along with the required documents, MCA will approve the registration and a CIN (Corporate Identity Number) will be allocated. You can also track this CIN online on MCA portal. What is the Cost involved in Private Limited Company Registration?